Results showed overall survival improves with accurate staging in clinical stage I NSCLC. Credit: Harmik J. Soukiasian, M.D. Significant upstaging or reclassification to a more advanced stage due to cancer progression in non-small cell lung cancer (NSCLC) can occur with each successive week from initial clinical staging to surgery, according to data presented at the American Association for Thoracic Surgery's 98th Annual Meeting. The same study showed that early intervention after completion of clinical staging leads to increased survival rates. Clinical staging describes the severity of a patient's cancer based on the magnitude of the primary tumor and the extent to which this cancer has spread. National Cancer Comprehensive Network (NCCN) Guidelines recommend surgery within eight weeks of completed clinical staging for NSCLC. Surgery offers a chance for cure in the approximately 15 percent of patients who are diagnosed with stage I NSCLC, but effective treatment requires accurate staging to guide effective management. 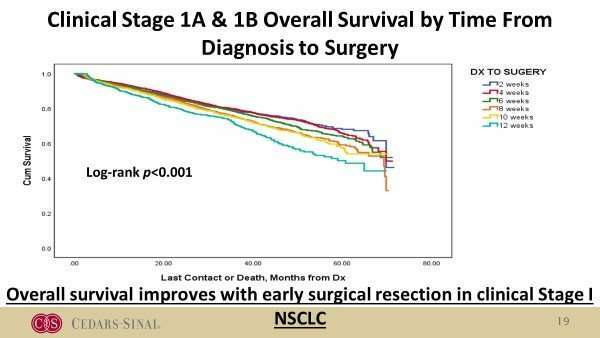 Delay in surgery in clinical stage I is associated with increased upstaging and decreased survival. "Our study evaluated the possibility of cancer upstaging using a more granular analysis, looking at the rates of upstaging for each progressive week from week one to week 12 for patients with stage I NSCLC," explains Harmik J. Soukiasian, MD, Chief, Division of Thoracic Surgery, Cedars-Sinai Health System, Los Angeles, who led the study. Investigators examined treatment data of approximately 52,000 clinical stage I NSCLC patients undergoing surgical resection from the National Cancer Data Base (NCDB). Patients who had anatomic lobar resection and lymphadenectomy or lymph node sampling, who did not receive pre-operative chemotherapy for clinical stage I NSCLC, were analyzed and compared to their eventual pathologic staging. 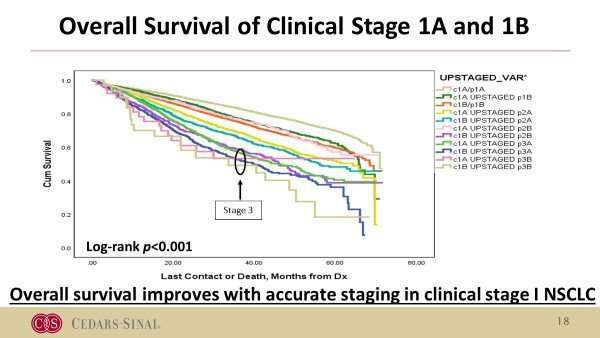 The rates of upstaging for stage I tumors were evaluated based on the time from completed clinical staging to surgery for the first twelve weeks. Subgroup analyses were performed for IA and IB adenocarcinoma and squamous cell carcinoma. Overall survival improves with early surgical resection in clinical stage I NSCLC. Credit: Harmik J. Soukiasian, M.D. Results showed overall survival improves with accurate staging in clinical stage I NSCLC. There was significant cancer upstaging with each progressive week from clinical staging to surgery, with a significant increase of upstaging to stage 3A, reinforcing the need for surgery within the NCCN guideline recommendation of eight weeks or earlier. Upstaging occurred for both adenocarcinoma and squamous cell carcinoma. Stage IA upstages at a higher rate than IB. "An astonishing number of clinical stage I NSCLC patients upstaged to 3A disease at the time of surgery. Interestingly, a higher proportion of both clinical IA and IB patients upstaged to 3A versus 2B, suggesting a possible need for more aggressive mediastinal staging, even in early-staged patients. Although current national guidelines recommend surgery within eight weeks from diagnosis, our study demonstrates there is a benefit in doing surgery even within a week to week basis," concludes Dr. Soukiasian.